The following information is meant only to answer some of our more frequently asked questions. Please don't hesitate to pick up the phone and call if you have any additional concerns. We pride ourselves on personalized service. We are a small, client-centric operation catering to groups wanting a more intimate and private experience. We prefer to fish no more than 5 anglers on our charter boat, but we're happy to accommodate up to 6 anglers within the same party. Our self-guided boat can accommodate 4. We believe we can offer the best experiences to groups of 8 or less, but under special circumstances, we can accommodate groups up to 12. Self-guided and charter package pricing is available for 6-day trips, generally Saturday through Friday. Longer and shorter duration trips can also be arranged. Packages include lodging, meals, use of quality foul weather gear, unlimited fish processing, and unlimited fish boxes. Self-guided packages include unlimited fishing on our self-guided skiff and the first tank of fuel and are priced at $3,250 per person. Charter packages begin at a base price of $3,250 per person. Charter fishing days on our 2018 North River 2700S can be added for $250 per person, per day, with a minimum of three anglers on the boat. Subject to availability, charter package guests may also use our self-guided skiff. Not included in packages are air travel, transportation between your arrival city and Port Protection (see below for options), alcoholic beverages, and gratuities as you see fit. Please call if you would like to arrange a custom-tailored package for a larger group, a private tournament, or a longer duration trip. Part of the allure of Port Protection is its remoteness. If you have the time and an adventurous spirit, you can take the Inter-Island Ferry to Prince of Wales Island and then drive 100-plus miles of paved and logging roads to the end of the line at a beach several miles from Port Protection, which is inaccessible by car. We'll pick you up there in one of our boats. Otherwise, you can take a float plane or opt for pickup in our charter boat. Charter boat pickup and dropoff is more economical, more convenient for transporting loads of frozen fish, and a great way to see more of our spectacular coastlines and sea life. We will pick you and your gear up in Petersburg — which has daily jet service from Seattle/Tacoma on Alaska Airlines — and ferry you to Port Protection aboard our new 27' charter boat. At the end of your trip, we'll ferry you back, along with your freshly frozen catch. A $125/person fee each way applies. In the rare event that weather conditions prevent boat pickup or dropoff, we'll arrange alternate transport and apply any fees you've paid us for boat travel toward the cost. If you prefer to travel by air, there are several “mail” flights a week into Port Protection that may have a seat or three available, but we recommend Pacific Wings from Petersburg, Sunrise Aviation from Wrangell, or Taquan Air from Ketchikan for a guaranteed seat at an affordable rate. The plane will drop you right at our dock. Call us if you have any questions or need help arranging float plane travel. Packages include all meals, including box lunches and bottled water on the boats. Please advise us of any special dietary requirements before booking. We provide Grundens rain coats, although you're welcome to bring your own. You should also bring deck boots and fishing clothing. Port Protection has only one store that has everything you really need and not a thing you don't. Eggs and milk? Yes. Gardenburgers? No. DEET? Yes. Glade Plug-ins? No. Because of its remoteness, everything is more expensive in Port Protection. Beer and liquor can be purchased. Underdog Sportfishing holds Charter Halibut Permit #4731 for IPHC Area 2C, issued by NOAA. Under the permit, you may retain halibut according to the bag limits and legal sizes that are determined each year by fisheries scientists. 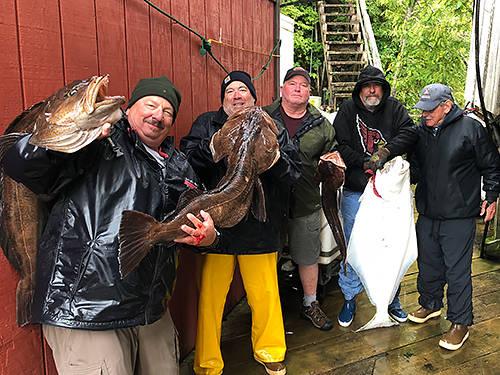 For example, during the 2016 season, charter anglers were allowed to retain one halibut per day less than or equal to 43" or greater than or equal to 80". Note that anglers fishing aboard charter boats without a Charter Halibut Permit may not keep halibut. We also participate in the GAF (Guided Angler Fish) program. In simple terms, this allows us to acquire for our clients some of the annual catch share allocated to the commercial fishery. Regulations are always subject to change, but currently our participation in the GAF program allows our clients a daily bag limit of two halibut of any size. Please note that an additional fee of $382 per fish applies to offset the cost of the GAF tags. Keep in mind that the GAF program only allows us a certain number of "extra" halibut per season. When the quota is depleted, clients may still retain the daily bag limit for charter anglers. We'd be happy to discuss this in more detail by phone. The text of the rule is: Effective January 13, 2014 the Pacific Halibut Catch Sharing Plan (CSP) authorizes annual transfers of commercial halibut IFQ as guided angler fish (GAF) to charter halibut permit holders for harvest in the charter halibut fishery. GAF offers charter halibut permit holders in Area 2C or Area 3A an opportunity to lease a limited amount of IFQ from commercial quota share (QS) holders to allow charter clients to harvest halibut in addition to, or instead of, the halibut harvested under the daily bag limit for charter anglers. Charter anglers using GAF are subject to the harvest limits in place for unguided sport anglers in that area. Currently, there is a two-fish of any size daily bag limit for unguided sport anglers in Areas 2C and 3A. GAF harvested in the charter halibut fishery will be accounted for as commercial halibut IFQ harvest. Underdog Sportfishing takes extreme pride in having a positive relationship with our guests, many of whom come back year after year. Those who have been here understand that we run an exclusive business in the middle of nowhere. The following policies are in place not only to protect us, but also to assure you we are taking care of our end of the business up here. With a limited number of spots and available dates, we recommend you reserve your desired dates as early as possible. A $1,000 per person deposit is the only way to reserve a date. An additional deposit totaling 50% of the package price is to be received no later than March 1 of the year of your trip. The entire balance is due on May 10 of the year of your trip. Reservations made after March 1 of the year of the scheduled fishing trip must be paid in full within 30 days of booking but no fewer than 30 days prior to your scheduled arrival. Availability and rates are subject to change at any time and without notice. Underdog Sportfishing accepts checks and all major credit cards. Reservations that do not comply to the above deposit and payment policies may be subject to cancellation. Underdog Sportfishing understands that sometimes unexpected events can get in the way of travel to remote regions. To protect your investment as well as ours, we recommend that all our guests purchase travel insurance at the time of booking so you know you are covered in the event of an unplanned emergency. Underdog Sportfishing will will go above and beyond your expectations but sometimes inclement weather or some other condition beyond our control can occur. Underdog Sportfishing will not be held liable for any conditions beyond our reasonable control.These losses may include but are not limited to: loss of fishing time, transportation, lodging, meals, luggage, fish boxes, and/or flight delays. All cancellations will result in loss of deposit. Cancellations made fewer than 100 days prior to scheduled arrival will result in a loss of 50% of the total package price. Cancellations made fewer than 60 days prior to arrival will forfeit 100% of the total package price. Underdog Sportfishing will make every effort to fill your spot, but these trips require months of planning from a client perspective. The season in Alaska is short, and operating a remote lodge is time- and labor-intensive and requires significant financial outlay. Because of this, there are no exceptions to this cancellation policy.